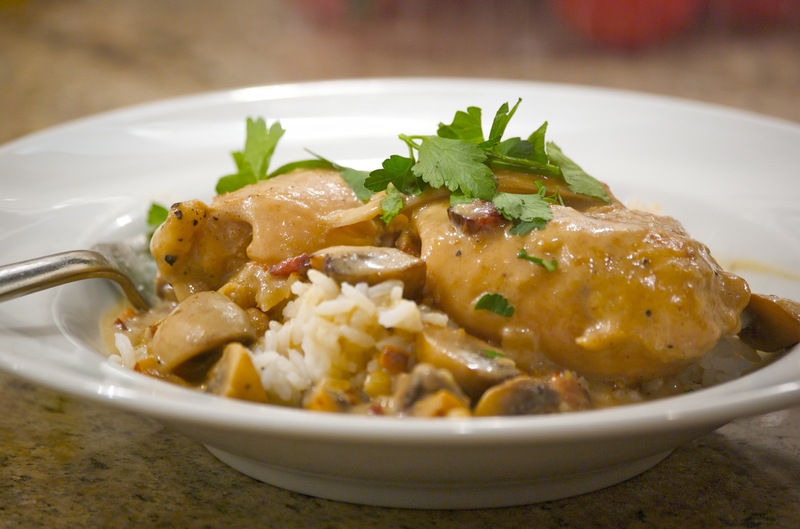 Picture this: it’s 6 o’clock and I’m staring at the boneless, skinless chicken thighs and a package of mushrooms that I’d planned on turning into coq au vin. But that would require reducing a bottle of wine, cutting up lots of vegetables, and browning those thighs. I’m beat, because Husband has been on a business trip for 5 nights now, and my two hungry and increasingly impatient kids are about to eat one of the cats, or each other. It’s time for Plan B. I often discover Plan B, in such cases, in The Best 30-Minute Recipe, compiled and published by the folks over at Cooks’ Illustrated. The book is a veritable compendium of ideas for people wanting a real meal in short order, but I am partial to their chicken braises. The recipes offer a slew of ways to dress up boneless, skinless chicken pieces, and they use common sense (preheat your oven or start pasta water/rice boiling before beginning the recipe) and unconventional techniques (such as the use of the microwave in this recipe) to streamline the dinner-making process. It took me a long time to try out any of these recipes, mostly because the idea of par-cooking the chicken in the microwave offended my sensibilities. We lived a long time without a microwave – and though I now use one daily, it’s mostly to melt butter or heat up pancakes for the kids’ breakfasts. And what about the alleged dangers of microwaving plastic wrap,* which is essential to building up the steam necessary to keep the chicken moist? After my mother-in-law recommended the recipe for a quick chicken tagine that used the same methods, I decided it was worth a try. To avoid the plastic wrap melting onto the chicken, I simply lay a piece of parchment over the chicken pieces before sealing it with the plastic wrap – that way, no contact. And, I have to admit, you end up with nice, moist chicken that is ready when the rest of the meal is. And, my friends, that’s a win on a night when dinner in 30 minutes or less is imperative, but you don’t want to call the pizza guy. Season chicken with salt and pepper, and place in a single layer in a microwave-safe casserole dish. Lay a piece of parchment slightly smaller than the dish over the chicken pieces. Seal the dish tightly with plastic wrap. Microwave on 50 percent power for 15 minutes. Meanwhile, saute the bacon with the oil in a large Dutch oven over medium heat until the bacon begins to render its fat (about 2 minutes.) Add the onions, mushrooms and a pinch of salt, and cook until golden brown – about 10 minutes. Stir in garlic and cook, stirring, another 30 seconds. Stir in the flour and cook, stirring constantly, for about 1 minute. Add the wine, scraping up any brown bits from the bottom of the pan. Stir in the broth and bring to a simmer. Reduce heat to low and add microwaved chicken and any of its juices to the stew Cover and cook for about 10 minutes, until the chicken is cooked through and tender. Stir in the cream and the parsley and return to a simmer for another minute or two. Season with salt and pepper to taste, then serve over noodles or rice, or with crusty bread. The casserole dish will be extremely hot when it comes out of the microwave. Put it on a trivet, dry towel or a dry counter to avoid it shattering. * It appears the jury is still out on plastic wrap, but since it’s rarely imperative for it to come into contact with the food, I try to make sure it doesn’t. That seems reasonable to me. I tried this one last night. My husband is a rather picky eater, and so to get him to agree to it I had to replace the heavy cream with fat free half and half, and used 1 pound of chicken thighs and 1 pound of chicken breasts (he’s not a thigh man!). It was good, but didn’t have the rich-looking sauce of yours. Also, we decided it may be tastier with some other vegetable added – peas?